The necropolis Velika and Mala Crljivica is located in the village of Cista Velika along the main Trilj-Imotski road in a length of 200 meters. South of the so called Velika Crljivica, the eastern part of the site, lays a karst sinkhole with seven wells constructed in the Middle Ages, i.e. in the Early Modern Age. 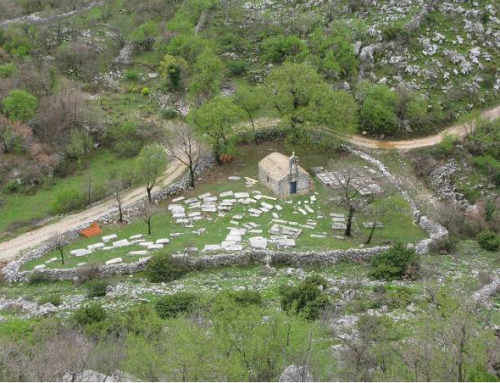 102 stećci of all basic types have been preserved: slabs, chests and gabled roof tombstones. Decorative motifs are the following: crosses of all forms, anthropomorphic lilies, hunting scenes, scenes of people dancing kolo (wheel-dance), jousting scenes, various vegetal motifs, crescents, stars and half-spheres. 52 stećci bear decorations. Two stećci have partially preserved inscriptions in Cyrillic script mentioning the spouses Jerko and Vladna Kustražić. The site has been developing almost continually since prehistoric times. It is a complex archaeological site with several development phases. The first phase is represented by three Bronze Age tumuli – mounds, so called Velika and Mala Crljivica (Big and Small Crljivica) north and south of the road. Their creation is associated with the nearby prehistoric settlement of Čelanova gradina (hillfort) and other forts and tumuli in the area. All these sites are actually related to the road in the area which had been constructed, given its terrain features, in the earliest periods of human history, connecting the present Sinj and Imotski areas. A water retention in a nearby sinkhole certainly contributed to the creation of the sites precisely there. 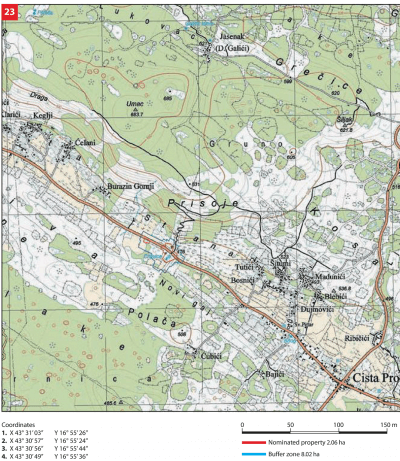 The second phase was marked by the ancient Salona-Tilurij-Nove-Narona route partially overlapping in that spot with the present route and, according to the findings of archaeological research, partially located north of it. In the first decades of the 1st century, the Romans built a road in the area connecting Salona (the capital of the Roman province of Dalmatia) and Narona (in the Neretva Delta).The road was a very important section of the main road that ran through the east Adriatic hinterland and linked Aquileia (in northern Italy) and Dirahij (Durres in today’s Albania). 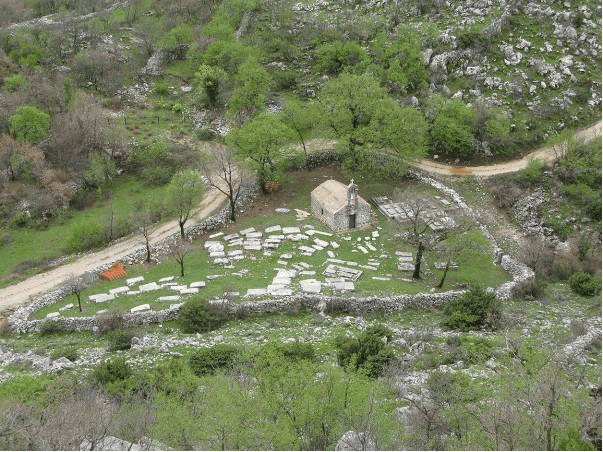 The third phase was related to the medieval cemetery with stećci that developed throughout the 14th and 15th century on the mentioned tumuli and around them following the ancient and the then medieval communication lines. Roads and wells are usually the places where cemeteries with stećci are frequently found. Placing the graves along the road is a custom going back to the antiquity. During the Middle Ages, the area was probably part of the parish of Radobilja, a large administrative and ecclesiastical territorial unit extending from the Cetina River left bank to the north and east. During the 14th and 15th century, this area, except for the lower gentry, was under the rule of the noble families of Nelipićes, Jurjević-Vlatkovićes and Kosačas. It is possible that part of the site was owned by the Kustražić family – one of the local noble families of Vlach origin, mentioned in the inscriptions on the stećci and in written documents. The construction of wells in sinkholes probably started at that time, although the engraved year on one of them dates it to 18th century. During the period from late 15th and early 16th century, burials had been rare in the area, but they continued during the Ottoman Empire and immediately after that period to the first half of the 18th century. Although part of the area (given its toponym Zgon) could have been used already in the Middle Ages for agriculture, the process of formation of agricultural land began after the region had been freed of the Turks, while the current arrangement of agricultural land is the result of numerous divisions throughout the past. The only areas neither divided nor cultivated were the area around the well (as a common area of the village where cattle came to drink water) and the area of stećci that was not cultivated out of respect for the dead, but also out of fear and superstitions associated with cemeteries. Therefore, the period of the 18th century was the time when the site got more or less its present appearance. 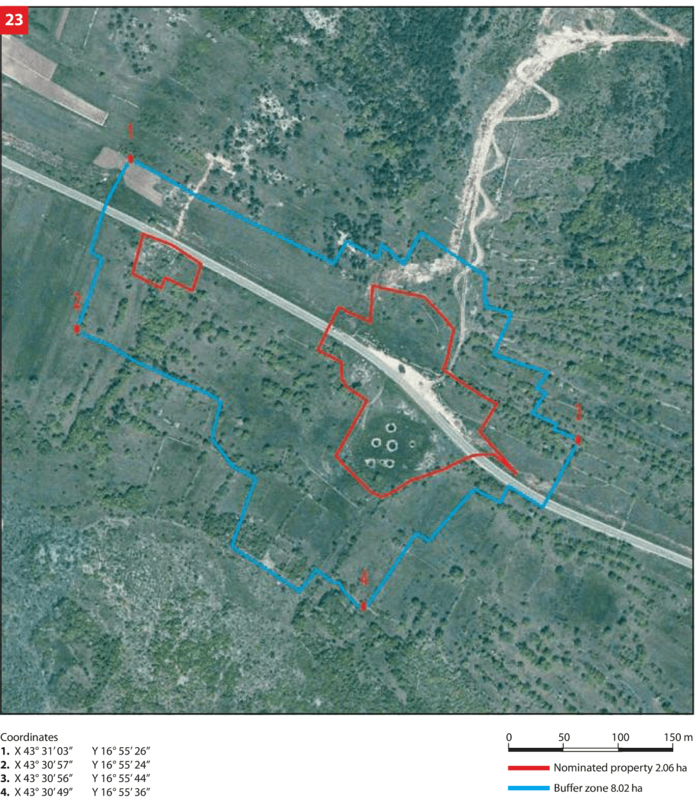 A local water supply system was built across the northern part of the site in July and August 2004, and part of the cemetery with 41 graves was explored on that occasion. Findings from the graves (money, jewellery, metal shoe parts) date back to the time from mid-14th to end 17th and early 18th. The site extends on both sides of the road in the eastern part of the settlement of Cista Velika. 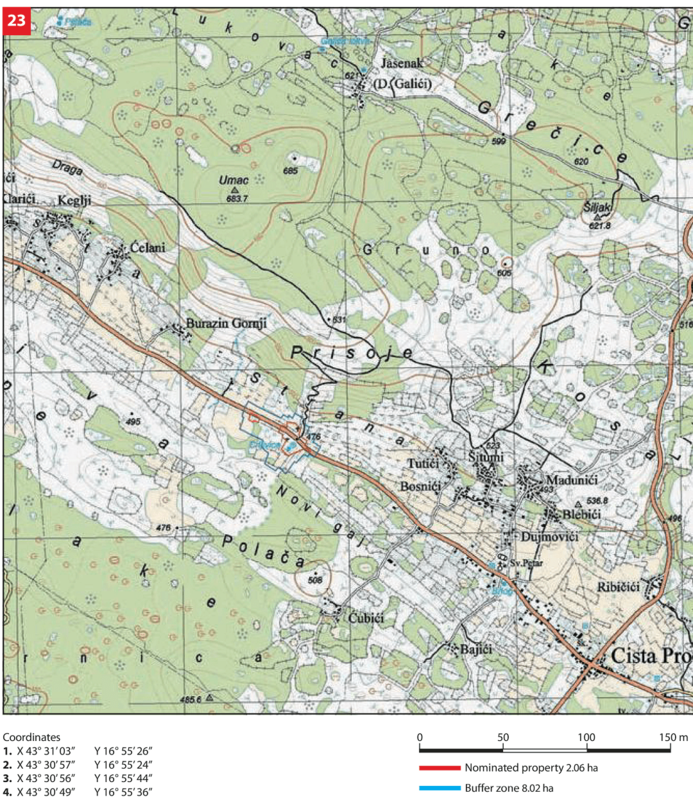 It is delimited by dry stones dividing the meadows on both sides of the road and within which three groups of stećci, prehistoric tumuli and wells are found. The state of conservation of the site is satisfactory. Judging by their arrangement, most of the stećci have been preserved in situ. 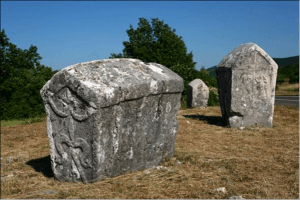 We assume that a few of them were destroyed over time and it is possible that there used to be more, but not many more than the preserved number of the stećci. The majority of problems to be expected are caused by impacts of environmental factors (water, ice) and biological factors (moss, lichen) on the stone surface. As a prerequisite for any conservation work on the cultural property, a recording of the present state of the site was made, as well as a related report with a detailed description of each stećak (and of all other parts of the site). A number of the stećci were scanned by a 3D scanner. The obtained data shall allow selection of the most affected ones, so that conservation-restoration works of removal or mitigating the impact of the aforementioned aggressive factors can start. During 2013, activity on conservation and restoration analyses and examination of the state of certain stećci, i.e. of the state of the stone itself, as well as minimal conservation works began. Minimal and simple cosmetic works are required to reconstruct a part of demolished dry stone, and in the area around the aforementioned wells, where only collapsed or damaged parts require reconstruction. Over the past couple of years, the site has been under intensive maintenance in terms of reconstruction of dry stone and vegetation removal. The exact annual number of tourists and visitors who visited the nominated site is not known. The number of visitors per year probably ranges between 4,000 and 5,000 (rough estimate) mostly during the summer months. Although the number of tourists in the immediate area is extremely large, there is no significant pressure on those sites and they are therefore not endangered. There are two info boards at the site in Croatian and English providing explanations for this and the neighbouring sites. There is no visitors’ reception centre or any other supporting facility, while the parking lot placed on part of the very site needs to be relocated in the near future. There is no sanitary facility at the site. In the immediate vicinity (within 30 km) there are several restaurants and shops, while current accommodation capacities are very modest. The Rescue Service of the Republic of Croatia is very well organised through the National Protection and Rescue Directorate and a single phone line 112 as well as numerous local „units“ (Croatian Mountain Rescue Service, local health centres and clinics, police stations, fire departments and units). There are several such organisational units in the immediate surrounding area (Volunteer Fire Brigade Lovreć, Healthcare Centre of the Split-Dalmatia County-Infirmary Lovreć, Police station Imotski).